As a young girl more than fifty years ago, Evelyn (Coopchiak) Yanez listened to renowned storyteller Annie Blue of Togiak tell her stories. During the course of this long-term project, Annie has told many more stories. More recently, Ben and Eliza Orr, Evelyn Yanez, and Dora Andrew-Ihrke collaborated in collecting, transcribing, translating, and refining these stories. Because of the long term relationship between Annie Blue and Evelyn Yanez, and the trust developed between Annie and the Math in a Cultural Context project, Annie was willing and eager to share her stories so the next generation would learn. With deep admiration for all those who contributed to this collection of stories in honor of Annie Blue and to Annie Blue herself for her willingness to share her gift of storytelling, we present this collection. Annie Blue was born on February 21, 1916, in a place called Qissayaaq along the Togiak River. She was one of nine children. Annie moved to Togiak around 1945, where she still lives. 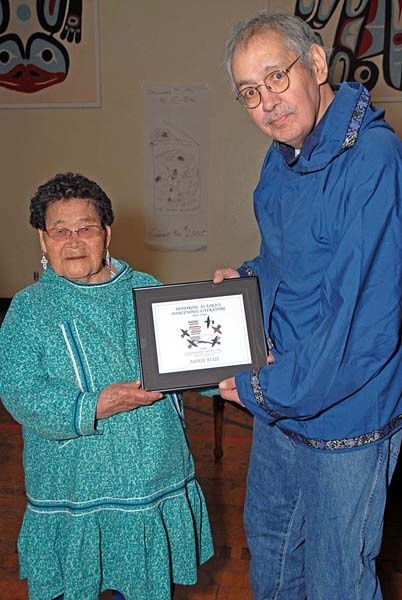 She married Cingakaq (Billy Blue) and had seven children; four survived birth and one (Nellie) is still living today. She has 15 grandchildren, 25 great-grandchildren and 1 great-great grandchild. When asked how she became a storyteller, Annie credits Saveskar, the storyteller in her village. Today, Annie is a respected storyteller, carrying on the oral tradition of Yup’ik storytelling. Sukdu Nel Nuhghelnek: I’ll Tell You A Story is an important book for several reasons. This is the first Dena’ina book that coordinates written text and sound. The stories are a colorful portrait of Dena’ina life and language, and the book and audio CD function as language learning tools. Walter and I had a lot of fun with the stories as we tape-recorded them at the Johnson’s’ home in Homer in 2002 and 2003. Walter told some of the stories spontaneously. For some we paused the recorder to think about phrases. During proofreading sessions, Walter made inserts and changes in some stories. Walter Johnson was born along the Kvichak River, June 14, 1922 to Alf Johnson, a man from Estonia, and to Annie Rickteroff. His mother was the daughter of William Rykhterov, son of a Russian and Dena’ina woman. The youngest of twelve children, Walter lived much of his early life as an only child. He and his mother lived alone in Lonesome Bay in the northeast corner of Iliamna Lake. Walter’s fluency in his native language, making him a rarity among the Dena’ina people of Old Iliamna Village, is due to this mother only speaking Dena’ina at home. Through the years he used this knowledge by acting as an interpreter of his Dena’ina language. 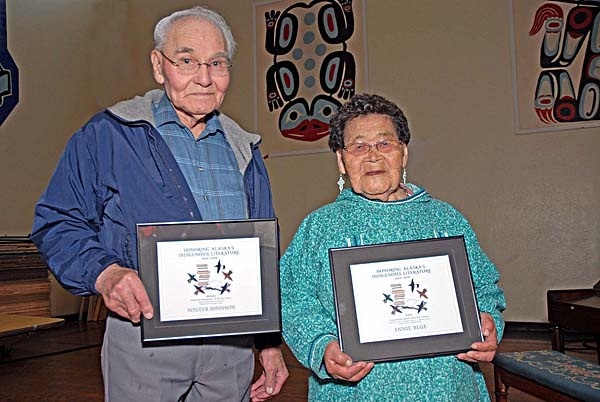 His mother also passed on to him much of the oral history and literature of the Dena’ina people of the area. At the age of 24, Walter married Annie Mysee of Old Iliamna Village. They had three children. Walter and Annie presently live in Homer, Alaska. Blonde Indian, an Alaska Native Memoir, traces one life from childhood in the Juneau Indian Village through adulthood in California and an eventual return home. Since its publication by the University of Arizona Press in 2006, Hayes’s memoir has earned recognition as an honest and welcome addition to Native American literature. Called a “rewarding, evocative, ultimately uplifting view of Native life” by Booklist and “one of the most important books to come out of Alaska” by the Anchorage Press, Blonde Indian received a 2007 American Book Award, was chosen as a 2006 Book of the Month by Native America Calling, and was named a Kiriyama Prize nonfiction finalist and a creative nonfiction finalist in the PEN Center USA Literary Awards. A member of the Wolf House of the Kaagwaantaan, Ernestine Hayes’ work has been published in anthologies, journals, and other media. She has been an assistant professor of English at the University of Alaska Southeast Juneau campus since receiving a Master of Fine Arts in Creative Writing and Literary Arts from the University of Alaska Anchorage in 2003. She is the grandmother of four. Jennie Weaves an Apprentice: a Chilkat Weaver’s Handbook, by Clarissa Hudson, is a beautiful portrayal of the time-honored apprentice relationship. It is also a handbook for weavers that depicts weaving techniques, offers tips and includes stories surrounding Clarissa’s work. Her essays are varied, from her trip to museums “visiting the relatives,” to her world view on subjects such as northwest coast art, to living an honorable life. The book is rich with creative spirit and it is an honor that this talented artist, writer, weaver has chosen to share her knowledge with others. Jennie Weaves an Apprentice should be on the shelf in every Tlingit home. Although I would like to see this book published by a national publishing house, currently it is a limited edition. It deserves a wider audience. Clarissa Hudson is Tlingit, Raven T’akdeinaaan (Sea Tern), Snail House in Hoonah, born and raised in Juneau, Alaska. She is a world-renowned weaver and artist whose award wining creations are in various private, corporate, public art collections nationwide and internationally. Since 1980, Clarissa has focused on artwork inspired by her Alaska Native heritage. Between 1983 to 2005, she designed and created 50 traditional Alaskan ceremonial robes, including Chilkat, Ravenstail and Button Blanket robes as well as numerous traditionally-inspired carvings, paintings, small weavings, and collages. In Honor of Eyak includes stories told by Annie Nelson Harry in Eyak that were translated by her husband. She told us that she had learned them from “Old Chief Joe.” We are fortunate to have several of these tales told not in only one version, but in two by Anna herself — an earlier version in 1933 when she was a young woman of 27, living where she was born and raised, and married to another Eyak, and a later version from Anna now thirty to forty years older, after living a long time in Yakutat, married to Sampson Harry. For the earlier version we have only her first husband’s English translations, and for the later we have Anna’s Eyak originals. It is very interesting to compare the two versions, not for their language, of course, but for the difference in content of the story, which is often very great, and reflects very deeply the story of Anna’s life and Eyak history. The versions she hold in her later life are now much fuller with personal meaning, wit, and wisdom that could only be Anna’s, and Eyak. I have presented these in chapters that I have entitled with the names of the issues they really treat at their deepest level: (I) On Greatness and Smallness; (II) On Goodness and Evil; (III) On Husband and Wife; (IV) On Identity and Conflict; and (V) On the Beginning and End of Eyak History. Yet in spite of their real significance, and in spite of all the misery, horror and tragedy that Anna lived through, her style is basically cheerful and war-hearted. She is sometimes masterfully satiric, but her soul is not embittered by human foibles or inscrutable fate, no matter how cruel these have been to her. Her spirit is indomitable. She is a survivor. Michael Krauss, Professor Emeritus, joined the University of Alaska faculty in 1960, has been a professor of linguistics since 1968, and director of the Alaska Native Language Center since the center was established by state legislation in 1972 until his retirement in June 2000.